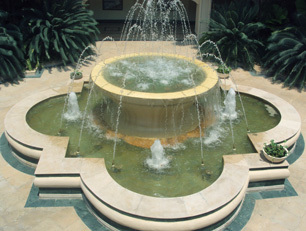 TBA is now mostly used in ornamental fountains and industrial cooling systems. Terbuthylazine (also known as TBA) is a chemical formerly used in the United States as an herbicide on a wide range of crops, including corn and sugar cane, but now limited in use to an algaecide/microbiocide for industrial water cooling systems and ornamental fountains. It degrades slowly in water, with half-lives reported in the range of two days to over a year. The EPA reports that it does not expect terbuthylazine to arrive in ground or surface water based on its current usage. Human studies have shown terbuthylazine to be an eye and skin irritant, and the Hazardous Substance Database reports that it may cause “shortness of breath, muscle spasms, ataxia, and anorexia.” Based on animal studies, the EPA has categorized it as being “slightly toxic” (Type III) with acute exposure. Although there is no evidence of carcinogenicity, the World Health Organization reports that chronic exposure to TBA has caused decreases in food consumption and adverse effects on red blood cells, liver, lungs, thyroid and testis. According to the World Health Organization, terbuthylazine may be treated with granular activated carbon.